Move-in day is a highly anticipated undertaking for college students everywhere, and UMBC is no exception. Lugging their suitcases, decorative furnishings, and pre-semester anxieties, UMBC students swarm the campus to turn their little dorm into home for the next four months. Sometimes they enjoy a little help from family and friends. Below are recent images of Retrievers moving in and enjoying the campus-wide welcome. A big thank-you to Alexis Harris ’19 for taking the photos! Move-in day excitement always carries over into Welcome Week activities where students meet up with old friends and make new ones, too! Below you can see glimpses of move-in days and welcome weeks of the past, courtesy of Retriever Weekly‘s past, available online in UMBC’s digital archives. 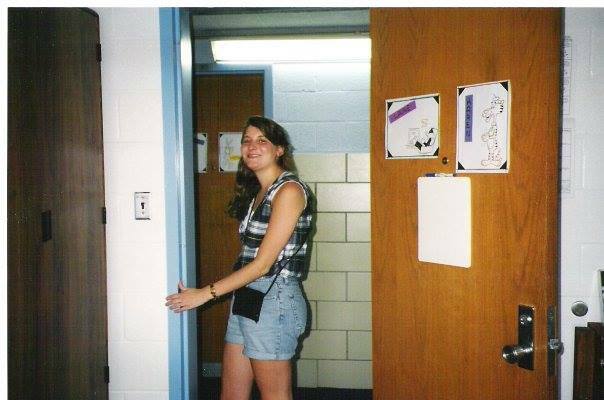 “I loved those first days so much that I decided to become a New Resident Student Assistant helping freshmen with their move-ins for the next two years, and a Resident Assistant my senior year,” recalls Karen Lewis ’97, American studies, about moving in at UMBC. Lewis is pictured below. What are some of your favorite move-in day memories at UMBC?